As we near end March its time to talk about the infamous Summer in Tamil Nadu. In possibly what is a prelude to the days to come Karur Paramathy recorded 41.8°C yesterday just short of the all time record for March of 42°C set on 3rd March 1978. Other places in the interiors like Vellore, Trichy & Salem also recorded above 38 degrees yesterday as interior places saw warmer than normal temperatures at many places. While the North Coastal Areas like Chennai saw the Easterlies modulate the day time temperature keeping it under check the morning temperatures are slowly inching up. Since the first week of March the minimum temperature at Nungambakkam IMD observatory has been above 26 with the AWS showing a minimum of 27.3 today as well. The pattern is going to be pretty much similar with warmer than normal temperatures expected in many interior places of Tamil Nadu particularly along the Northern areas adjoining South Interior Karnataka & Rayalaseema region. Places like Karur, Salem. Trichy could once again see a hot day with maximum temperatures close to 100°F and slightly more. 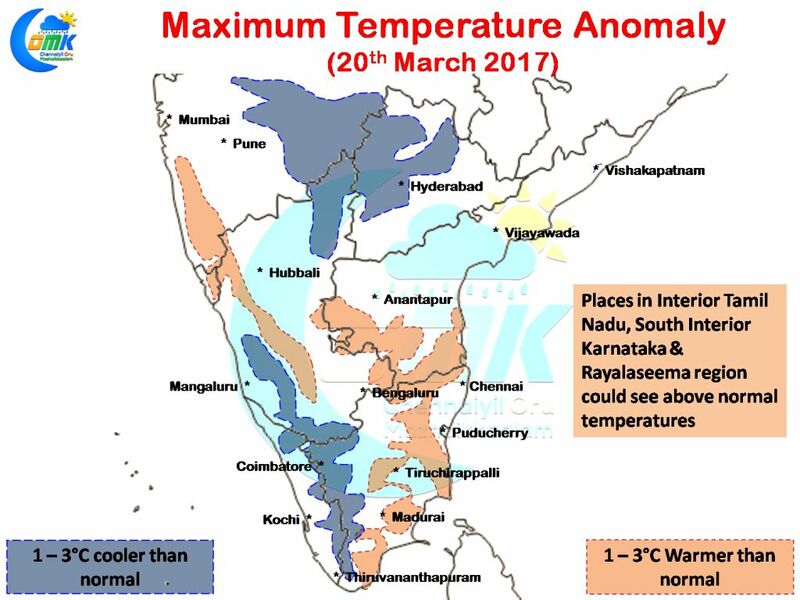 One or two places in South Tamil Nadu near Madurai & Tirunelveli is also likely to see temperatures around 37 / 38 degrees as day time highs. Chennai could once again see day time temperatures in the region of around 33 / 34 for the city areas and a degree or two higher in the suburbs. But once again the Easterlies are expected to moderate the temperatures keeping it closer to normal or just marginally above. Thanks to the Trough that persists from Chhattisgarh to South Tamil Nadu at about 0.9 kms MSL we can see some rains in the interior places around 100 kms away from the coast. Thanks to the overall suppressed atmospheric conditions these are likely to be isolated and possibly short duration localized activities.